The book’s title character, hero, and moral center, Uncle Tom is the head slave of the Shelby estate, sold to pay off Mr. Shelby’s debt. Uncle Tom’s new master, St. Clare, is a benevolent one, and Tom befriends St. Clare’s daughter, Eva. After St. Clare dies, Tom’s religious spirit is tested at the hands of Simon Legree, his final master, and Tom’s willingness to die for his Christian beliefs makes him a martyr and Christ figure. The timeline below shows where the character Uncle Tom appears in Uncle Tom's Cabin. The colored dots and icons indicate which themes are associated with that appearance. Schlegel, Chris. "Uncle Tom's Cabin Characters: Uncle Tom." LitCharts. LitCharts LLC, 17 Sep 2013. Web. 29 Mar 2019. Schlegel, Chris. 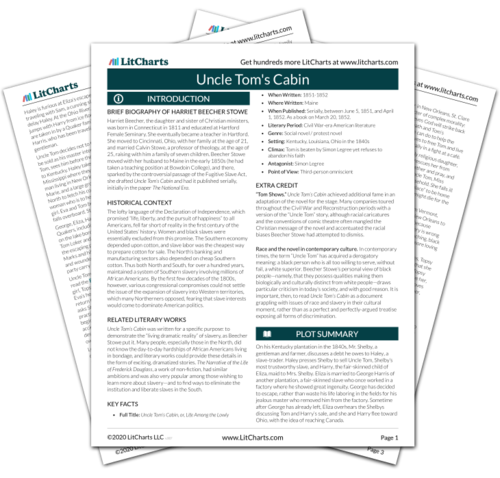 "Uncle Tom's Cabin Characters: Uncle Tom." LitCharts LLC, September 17, 2013. Retrieved March 29, 2019. https://www.litcharts.com/lit/uncle-tom-s-cabin/characters/uncle-tom.